California Consulting LLC attends League of Cities Los Angeles Division Membership Meeting - California Consulting, INC.
California Consulting participated in the League of California Cities LA County Div. meeting at the Culver Studios. We welcome the incoming President, Cerritos Mayor Carol Chen, and the rest of the 2015-16 Division Officers. 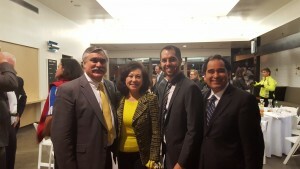 L-R Burbank Council Jess Talamantes, Cerritos Mayor and L.A. League of Cities President Carol Chen, San Fernando Mayor Fajardo, and Steve Samuelian of California Consulting.